We're moving! Our new address as of February 18, 2019, will be 1760 State Street, Racine. 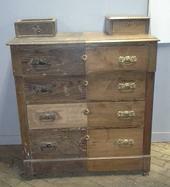 Furniture Renaissance specializes in antique furniture restoration and refinishing. Located in Racine, Wisconsin, services include restoration, refinishing, repair, upholstery, caning and other seat weaving, custom built pieces, gilding, and carving. Furniture Renaissance has been in business since 1990. We offer free estimates. You can visit the workshop and showroom at 1760 State Street, from 8 a.m. to 4 p.m. Monday through Friday and Saturdays or after 4 p.m. weekdays by appointment. There you will find both refinished and in-the-rough pieces for sale, a limited selection of prints, pictures and other smalls, see examples of our work and talk to us in person. On this site you will find photos, descriptions and prices of some of the items for sale.